As of the R1 2017 release, the Kendo UI distribution includes Sass-based themes. Default v2 - a modern update of the Kendo UI Default theme. Bootstrap v4 - has linked variables to the famous Bootstrap, in order to achieve similarity in the look and feel. Therefore, customizing the original Bootstrap theme will affect the Kendo UI theme as well. Material - an update of the Kendo UI Material to closely implement the Material Design Guidelines. Apart from being written in a different language, the Sass-based themes are slightly different from the Less-based ones. This article outlines those differences and demonstrates how to use the Sass-based themes. Each Sass-based theme is represented by a single CSS file that combines the layout and the themes of the components. As a result, you do not need to match a theme with its common file. Based on the widget you work with, the Sass-based themes can build a part of the widget theme in a similar way the Download Builder trims unused scripts. The Sass-based themes are available on NPM. Each theme is stored as an NPM package and can be easily upgraded. Each Sass-based theme is compatible with the Kendo UI components for Angular. This enables you to port parts of your application to Angular 2 while maintaining their styling. Flexbox layout—Not supported by Internet Explorer 10 and earlier. CSS gradients—Not supported by Internet Explorer 9 and earlier. Web Open Font Format—Not supported by Internet Explorer 8 and earlier. Border radius—Not supported by Internet Explorer 8 and earlier. Alpha transparency colors—Not supported by Internet Explorer 8 and earlier. Use the pre-build CSS files. Use the CSS files that are shipped with the Kendo UI distribution. For example, the Default v2 theme is distributed as styles/kendo.default-v2.min.css. Use the NPM package which contains a pre-built dist/all.css CSS file for the theme. For more information on how to obtain the NPM package, refer to the following section on using NPM packages. Kendo UI Default Theme—Available as @progress/kendo-theme-default. Kendo UI Bootstrap v4 Theme—Available as @progress/kendo-theme-bootstrap. Kendo UI Material Theme—Available as @progress/kendo-theme-material. To access the Progress NPM registry, you need an active Telerik account with an active commercial license. For more information on how to access the NPM registry, refer to the installation instructions for Kendo UI Professional. Obtain the theme source through the NPM package. Create a .scss file that will consume the theme. For the purposes of the this example, this is styles.scss. To build the theme files, import them into the file. To include the styles of specific widgets, use their names in the path. To customize the variables that are used in the theme, change the theme before you import the theme files. Build the styles.scss file through a Sass compiler. For example, use node-sass. The following list describes the theme variables available for adjustment in the Kendo UI Default theme. $font-size 14px Base font size across all components. $font-family inherit Font family across all components. $font-family-monospace Consolas, "Ubuntu Mono", "Lucida Console", "Courier New", monospace Font family for monospaced text. Used for styling the code. $line-height (20 / 14) Line height used along with $font-size. $border-radius 2px Border radius for all components. $accent #ff6358 The color that focuses the user attention. Used for primary buttons and for elements of primary importance across the theme. $accent-contrast #ffffff The color used along with the accent color denoted by $accent. Used to provide contrast between the background and foreground colors. $base-text #656565 The text color of the components' chrome area. $base-bg #f6f6f6 The background of the components' chrome area. $base-border rgba( black, .08 ) The border color of the components' chrome area. $base-gradient $base-bg, darken( $base-bg, 2% ) The gradient background of the components' chrome area. $hovered-text #656565 The text color of hovered items. $hovered-bg #ededed The background of hovered items. $hovered-border rgba( black, .15 ) The border color of hovered items. $hovered-gradient $hovered-bg, darken( $hovered-bg, 2% ) The gradient background of hovered items. $selected-text $accent-contrast The text color of selected items. $selected-bg $accent The background of selected items. $selected-border rgba( black, .1 ) The border color of selected items. $selected-gradient none The gradient background of selected items. $error #f5503e The color for error messages and states. $warning #fdce3e The color for warning messages and states. $success #5ec232 The color for success messages and states. $info #3e80ed The color for informational messages and states. $button-text $base-text The text color of the buttons. $button-bg $base-bg The background of the buttons. $button-border $base-border The border color of the buttons. $button-gradient $base-gradient The background gradient of the buttons. $button-hovered-text $hovered-text The text color of hovered buttons. $button-hovered-bg $hovered-bg The background of hovered buttons. $button-hovered-border $hovered-border The border color of hovered buttons. $button-hovered-gradient $hovered-gradient The background gradient of hovered buttons. $button-pressed-text $selected-text The text color of pressed buttons. $button-pressed-bg $selected-bg The background color of pressed buttons. $button-pressed-border $selected-border The border color of pressed buttons. $button-pressed-gradient none The background gradient of pressed buttons. $button-focused-shadow 0 3px 4px 0 rgba(0, 0, 0, .06) The shadow of focused buttons. $series-a #ff6358 The color of the first series. $series-b #ffd246 The color of the second series. $series-c #78d237 The color of the third series. $series-d #28b4c8 The color of the fourth series. $series-e #2d73f5 The color of the fifth series. $series-f #aa46be The color of the sixth series. $chart-major-lines rgba(0, 0, 0, .08) The color of the Chart grid lines (major). $chart-minor-lines rgba(0, 0, 0, .04) The color of the Chart grid lines (minor). $toolbar-padding-x $padding-x The horizontal padding of the container. $toolbar-padding-y $padding-x The vertical padding of the container. Outputs a module once, no matter how many times it is included. name: String—The name of the exported module. To contribute to the development of the Kendo UI Default Theme, refer to the telerik/kendo-themes GitHub repository it is stored in. 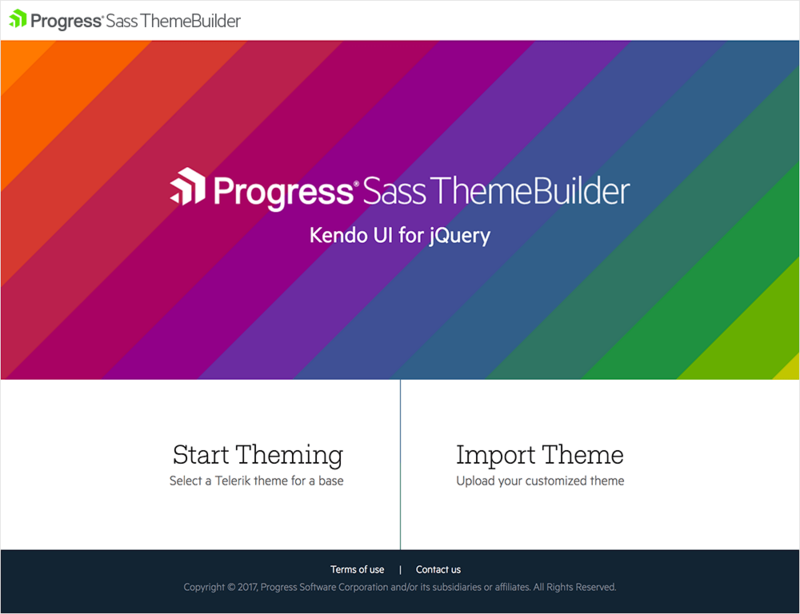 Progress Sass Theme Builder for Kendo UI is an Angular web application that enables you to create new or customize existing themes. The tool renders the same look and feel as the look and feel of all other components in the suite. It also delivers full control over the skin elements of each component and automatically updates its composite units. After you create the skin and achieve the desired look of the theme, the Sass Theme Builder enables you to download and integrate it in your project. On the initial Sass Theme Builder pane, select the Start Theming option. Choose one of the existing skins to use as a base. The currently available built-in skins are Default and Bootsrap. Color pickers which customize the appearance of the components. The Apply changes instantly option which enables you to observe the changes on the fly. Manual updates of each component element. Utilization of predefined color swatches. Color Swatches—Contains predefined color palettes that you can apply to all components in your application. Default—Provides the applicable color customization options. Preview Components—Keeps the main view of the components. It reflects the customization changes you make each time you add or remove theme elements. Download—Downloads the archive that holds the generated style files after the customization completes. When you click the button, a dialog appears and prompts you to name your theme. 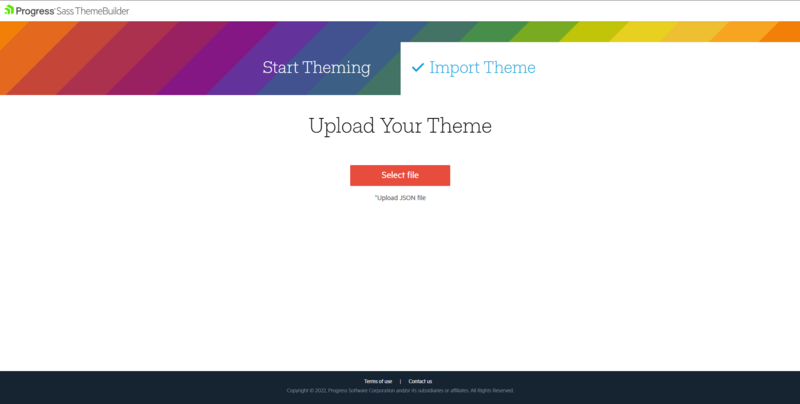 On the initial Sass Theme Builder pane, select Import Theme. Upload the variables.scss file which contains your current modifications of the customized theme. As a result, the selected components and styling elements load. Download the theme as a compact archive by clicking the Download button. Add the newly created Theme folder to your application. Include the all.css file in the head tag of your HTML document. Avoid referencing the kendo.common.min.css and kendo.rtl.min.css files because the exported CSS file contains all styles you need.